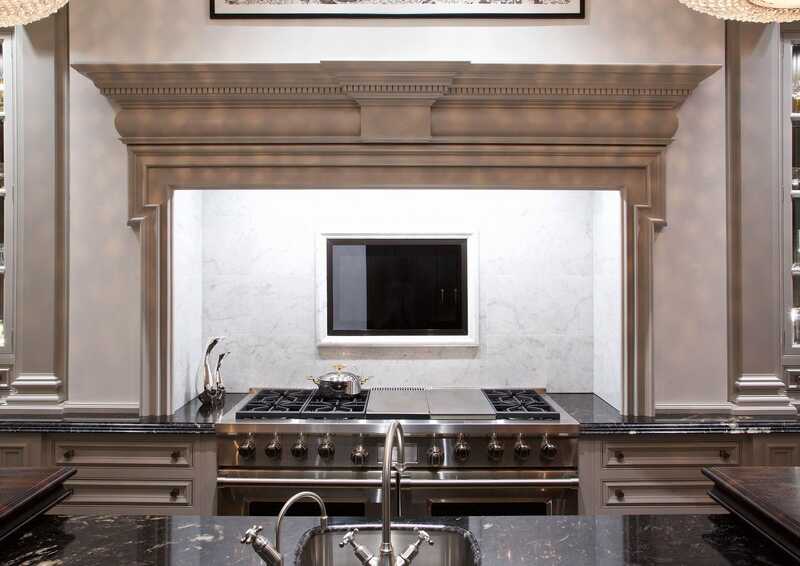 The Architectural Kitchen is one of our most celebrated designs and has been hugely popular since its debut. Recently we took the opportunity to revisit one of our original installations to demonstrate how our elegant design can seamlessly accommodate today’s interior and technology trends – providing timeless, luxury British design for the home. With a nod to today’s most popular palette, we applied a bold graphite to the focal point of the central Island complimented by paler grey palette on the key cabinetry and further enhanced by the striking Black Walnut doors that house the larger appliances. The Cabinetry is decorated with our new Classical Luxe handles and adorned with branded inserts. The inserts of our new handles can be fully customised to each client’s taste – wood, leather, crystal – even a personal insignia can be accommodated into our cabinetry jewellery for a truly unique scheme. Key concepts such as a Barista Bar are conveniently concealed, offering easy access whilst maintaining clean lines.